Aiken, SC--A celebration of life service for Mrs. Jeanette Kennington Anderson age 81 will be held 2:00 pm Saturday at Shiloh Baptist Church with Rev. Kenneth Catoe, Rev. Jeremy Creech officiating. Interment will follow in the church cemetery. Mrs. Anderson will be placed in the church one hour prior to services. Mrs. Anderson entered into rest Wednesday at Pruitt Health Aiken. 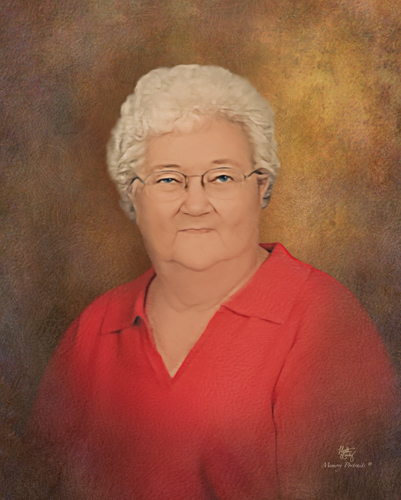 She as a native of Lancaster, SC and had made Aiken County her home for the past 30 years. Mrs. Anderson was the beloved wife of the late Rev. Louie Anderson and a daughter of the late Mr. Joseph Perry Kennington, Sr., and the late Mrs. Olivia Ruth Brock Kennington. She was an associate with Wal-Mart in the fabric department with 20 years service. Mrs. Anderson also was the secretary at Shiloh Baptist Church while her husband, the late Rev. Louie Anderson served there as Pastor for 16 years. She was a member of Shiloh Baptist Church and Joy Group Senior Group at the church. Mrs. Anderson was a very loving mother and grandmother. Survivors include one son, Joseph (Melisa) Anderson, Warrenville, SC, two daughters, Janet (Danny) Bell, Aiken, Lori (Shannon) Jordan, Wagener; one sister, Carolyn Lance, Kershaw, SC and 8 grandchildren, Daniel, Brock, Austin, Zac, Hannah, Nathaniel, Jacob, Emily, and Brandy. Mrs. Anderson was also predeceased by two brothers, Sonny and J.P. Kennington, three sisters, Joann Mackey, Margie Faile, and Joyce Faile. Pallbearers will be Shawn Jordan, Daniel Bell, Brock Bell, Austin Woodward, Zac Anderson, and Derrick Murray. Memorials may be made to Shiloh Baptist Church 3925 Shiloh Church Road, Aiken, SC 29805. A visitation with the family will take place 6-8 pm Friday evening June 22, 2018 at COLE FUNERAL HOME 1544 UNIVERSITY PARKWAY (118 BY PASS) AIKEN, SC, 29801. 803-648-7175. Please sign the online registry at www.colefuneralhomeinc.com.